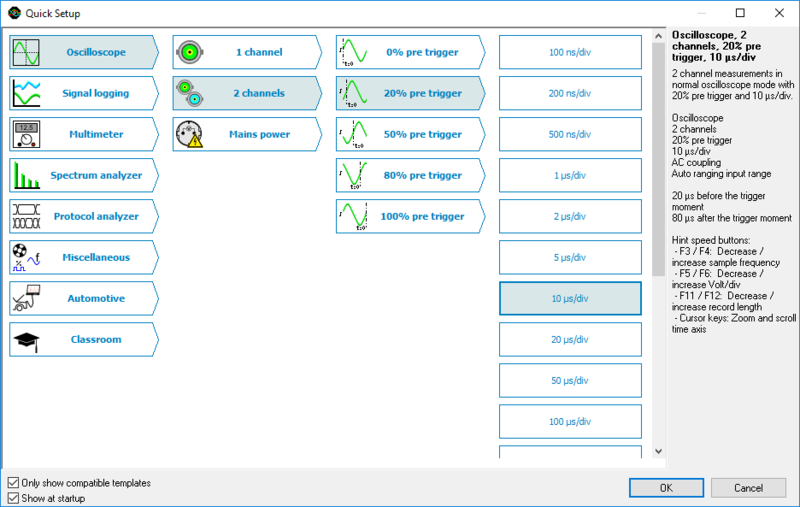 To simplify setting up the measurements, the Multi Channel oscilloscope software contains a large number of Quick Setups. A Quick Setup contains the basic settings for a specific measurement. After loading it, that specific measurement can be performed and if needed, small adjustments to the setup can be made. The Quick Setups are selected and loaded from a Quick Setup selection dialog, opened by clicking the Load Quick Setup button , selecting the Load Quick Setup option in the File menu or by pressing hotkey Shift + Ctrl + O. The Quick Setups are ordered in folders by measurement type, e.g. Oscilloscope, Protocol analyzer or Spectrum analyzer. Each measurement type can have up to two levels of subfolders, indicating the discriminating properties of the measurement, e.g. number of channels or communication protocol. The final level contains one or more Quick Setup that can be loaded. Folders and Quick Setups can be selected using the mouse or using the arrow keys on the keyboard. Selected folders and Quick Setups are indicated by their background color, the active selection is also indicated by a thick outline. The information pane at the right side of the dialog shows additional information regarding the selected folder or Quick Setup. It can also show a link to a web page with additional measurement information. Double-clicking the Quick Setup or pressing the Enter key will load the selected Quick Setup. Depending on the instrument that is used, certain Quick Setups may not be compatible with the used instrument, because it requires certain specifications that the instrument does not meet. These are e.g. a Quick Setup that requires more input channels than the instrument has, a Quick Setup that requires a higher sampling rate than the instrument supports, etc. Quick Setups not compatible with the connected instrument are hidden from the selection dialog by default. Unchecking Only show compatible Quick Setups will add these Quick Setups to the dialog and allows to load these Quick Setups. Note that after loading the instrument setup will be different than was intended, because of the incompatibilities.